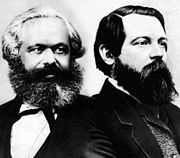 This article is about the concept of world revolution in Marxist theory. For other uses of the term, see World revolution (disambiguation). "Comrade Lenin Cleanses the Earth of Filth" (1920). World revolution is the Marxist concept of overthrowing capitalism in all countries through the conscious revolutionary action of the organized working class. These revolutions would not necessarily occur simultaneously, but where and when local conditions allowed a revolutionary party to successfully replace bourgeois ownership and rule, and install a workers' state based on social ownership of the means of production. In most Marxist schools, such as Trotskyism, the essentially international character of the class struggle and the necessity of global scope are critical elements and a chief explanation of the failure of socialism in one country. The end goal of such internationally oriented revolutionary socialism is to achieve world socialism, and later, stateless communism. The October Revolution of 1917 in Russia sparked a revolutionary wave of socialist and communist uprisings across Europe, most notably the German Revolution, the Hungarian Revolution, Biennio Rosso and the revolutionary war in Finland with the short lived Finnish Socialist Workers' Republic, which made large gains and met with considerable success in the early stages; see also Revolutions of 1917-23. Particularly in the years 1918-1919, it seemed plausible that capitalism would soon be swept from the European continent forever. Given the fact that European powers controlled the majority of Earth's land surface at the time, such an event could have meant the end of capitalism not just in Europe, but everywhere. Additionally, the Comintern, founded in March 1919, began as an independent international organization of communists from various countries around the world that evolved after the Russian Civil War into an essentially Soviet-sponsored agency responsible for coordinating the revolutionary overthrow of capitalism worldwide. With the prospect of world revolution so close at hand, Marxists were dominated by a feeling of overwhelming optimism, which in the end proved to be quite premature. The European revolutions were crushed one by one, until eventually the Russian revolutionaries found themselves to be the only survivors. Since they had been relying on the idea that an underdeveloped and agrarian country like Russia would be able to build socialism with help from successful revolutionary governments in the more industrialized parts of Europe, they found themselves in a crisis once it became clear that no such help would arrive; see Socialism in one country. After those events and up until the present day, the international situation never came quite so close to a world revolution again. As fascism grew in Europe in the 1930s, instead of immediate revolution, the Comintern opted for a Popular Front with liberal capitalists against fascism; then, at the height of World War II in 1943, the Comintern was disbanded on the request of the Soviet Union's Western allies. A new upsurge of revolutionary feeling swept across Europe in the aftermath of World War II, though it was not as strong as the one triggered by World War I which resulted in failed (in the socialist sense) revolution in Germany and a successful one (for seventy years) in Russia. Communist parties in countries such as Greece, France, and Italy had acquired significant prestige and public support due to their activity as leaders of anti-fascist resistance movements during the war; as such, they also enjoyed considerable success at the polls and regularly finished second in elections in the late 1940s. However, none managed to finish in first and form a government. Communist parties in Eastern Europe, meanwhile, though they did win elections at around the same time, Western media criticized the lack of liberal democratic elements in their rise to power. Nonetheless, Communist movements in Eastern Europe proliferated, even with some local cases independent of the USSR, such as the Yugoslav Partisans, who also were integral in repelling fascism during World War II. Revolts across the world in the 1960s and early 1970s, coupled with the Chinese Cultural Revolution, the establishment of the New Left together with the Civil Rights Movement, the militancy of the Black Panther Party and similar armed/insurrectionary "Liberation Front" groups around the globe, and even a bit of a resurgence in the labor movement for a time once again made it seem to some as though world revolution was not only possible, but actually imminent; thus, there was a common expression, "The East is Red, and the West is Ready". However, this radical left spirit ebbed by the mid-1970s, and in 1980s and 1990s there was a return to certain right-wing, economically conservative ideologies (spearheaded, among other examples, by Thatcherism in the United Kingdom and Reaganomics in the United States) and also free-market reforms in China and in Vietnam. Within Marxist theory, Lenin's concept of the labor aristocracy and his description of imperialism, and – separately, but not necessarily unrelatedly – Trotsky's theories regarding the deformed workers' state, offer several explanations as to why the world revolution has not occurred to the present day. Many groups still explicitly pursue the goal of worldwide communist revolution, calling it the truest expression of proletarian internationalism. Wikimedia Commons has media related to World revolution posters of the Soviet Union.